Tax Foundation is excited to host the 2017 Annual Meeting of the National Taxpayers Conference (NTC), an association of statewide taxpayers’ associations devoted to objective and unbiased analysis of public finance and tax issues in their states. 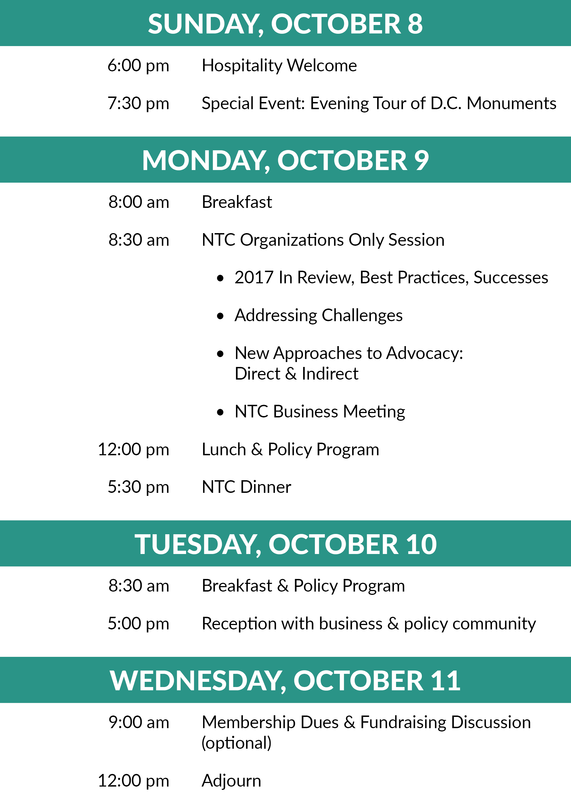 The annual meeting will include NTC roundtable strategizing, best practices for outreach, policy panels and presentations, and a closing reception with the business and policy community. After a welcome reception and exclusive evening monuments tour on Sunday, October 8, the conference begins Monday morning with members-only roundtables on strategy and outreach. Policy panels and presentations run through Tuesday, with an optional fundraising roundtable on Wednesday morning. The NTC Dinner will be Monday night, and there will be a reception with the business and policy community on Tuesday night. The host hotel for the 2017 Annual Meeting is the Topaz Hotel, 1733 N Street NW, close to Dupont Circle (Metro Red Line) but on a quieter side street. We have arranged a $199 per night (plus tax) room rate if you reserve through the form below. Reservations must be made by September 1 to receive the group rate. The meeting will be at Tax Foundation, 1325 G Street NW Suite 950.